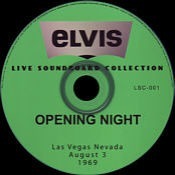 Notes: Because RCA chose not to record the actual opening show (31 July 1969) , this release will stand out as the earliest show fans will have of Elvis' return to live shows ! 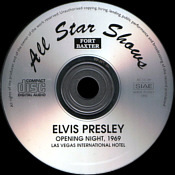 This one is a classic in the history of bootleg CD`s. 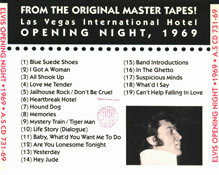 A complete concert from 1969 almost from the beginning of Elvis` live comeback. 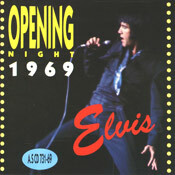 Actually it is not Opening Night but August 3, 1969 DS. 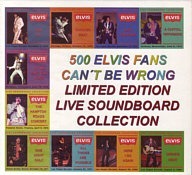 This show was re-released as "Elvis Meets The Beatles" and "Elvis Live Unlicensed"
Concert: This doesn`t matter as the show itself is a classic 69 performance, with no weak spot. Just lean back and enjoy a truely magnificent show in decent SB quality ! 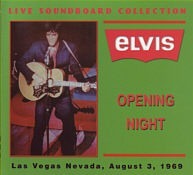 The monologue runs for 4:40 , Elvis describes his desire to return to live shows. 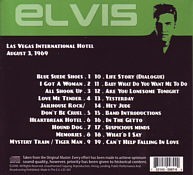 Suspicious Minds runs almost 8 minutes ! Same content as the on the first release. 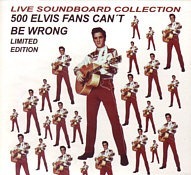 Number 1-10 (LSC-001 - LSC010) were released in a set and came out in a slipcase package.